Android M officially introduces several new keystore features into the framework API, but the underlying work to support them has been going on for quite a while in the AOSP master branch. The most visible new feature is support for generating and using symmetric keys that are protected by the system keystore. Storing symmetric keys has been possible in previous versions too, but required using private (hidden) keystore APIs, and was thus not guaranteed to be portable across versions. Android M introduces a keystore-backed symmetric KeyGenerator, and adds support for the KeyStore.SecretKeyEntry JCA class, which allows storing and retrieving symmetric keys via the standard java.security.KeyStore JCA API. To support this, Android-specific key parameter classes and associated builders have been added to the Android SDK. This is pretty standard JCA code, and is in fact very similar to how asymmetric keys (RSA and ECDSA) are handled in previous Android versions. What is new here is, that there are a lot more parameters you can set when generating (or importing a key). Along with basic properties such as key size and alias, you can now specify the supported key usage (encryption/decryption or signing/verification), block mode, padding, etc. Those properties are stored along with the key, and the system will disallow key usage which doesn't match the key's attributes. This allows insecure key usage patterns (ECB mode, or constant IV for CBC mode, for example) to be explicitly forbidden, as well as constraining certain keys to a particular purpose, which is important in a multi-key cryptosystem or protocol. Key validity period (separate for encryption/signing and decryption/verification) can also be specified. Another major new feature is requiring use authentication before allowing a particular key to be used, and specifying the authentication validity period. Thus, a key that protects sensitive data, can require user authentication on each use (e.g., decryption), while a different key may require only a single authentication per session (say, every 10 minutes). The newly introduced key properties are available for both symmetric and asymmetric keys. An interesting detail is that apparently trying to use a key is now the official way (Cf. the Confirm Credential sample and related video) to check whether a user has authenticated within a given time period. This quite a roundabout way to verify user presence, especially if you app doesn't make use of cryptography in the first place. The newly introduced FingerprintManager authentication APIs also make use of cryptographic objects, so this may be part of a larger picture, which we have yet to see. On a high level, key generation and storage work the same as in previous versions: the system keystore daemon provides an AIDL interface, which framework classes and system services use to generate and manage keys. The keystore AIDL has gained some new, more generic methods, as well support for a 'fallback' implementation but is mostly unchanged. The keymaster HAL and its reference implementation have, however, been completely redesigned. The 'old' keymaster HAL is retained for backward compatibility as version 0.3, while the Android M version has been bumped to 1.0, and offers a completely different interface. The new interface allows for setting fine-grained key properties (also called 'key characteristics' internally), and supports breaking up cryptographic operations that manipulate data of unknown or large size into multiple steps using the familiar begin/update/finish pattern. Key properties are stored as a series of tags along with the key, and form an authorization set when combined. AOSP includes a pure software reference keymaster implementation which implements cryptographic operations using OpenSSL and encrypts key blobs using a provided master key. Let's take a more detailed look at how the software implementations handles key blobs. Keymaster v1.0 key blobs are wrapped inside keystore blobs, which are in turn stored as files in /data/misc/keystore/user_X, as before (where X is the Android user ID, starting with 0 for the primary user). Keymaster blobs are variable size and employ a tag-length-value (TLV) format internally. They include a version byte, a nonce, encrypted key material, a tag for authenticating the encrypted key, as well as two authorization sets (enforced and unenforced), which contain the key's properties. Key material is encrypted using AES in OCB mode, which automatically authenticates the cipher text and produces an authentication tag upon completion. Each key blob is encrypted with a dedicated key encryption key (KEK), which is derived by hashing a binary tag representing the key's root of trust (hardware or software), concatenated with they key's authorization sets. Finally, the resulting hash value is encrypted with the master key to derive the blob's KEK. The current software implementation deliberately uses a 128-bit AES zero key, and employs a constant, all-zero nonce for all keys. It is expected that the final implementation will either use a hardware-backed master-key, or be completely TEE-based, and thus not directly accessible from Android. As discussed in the 'New keystore APIs' section, the setUserAuthenticationRequired() method of the key parameter builder allows you to require that the user authenticates before they are authorized to use a certain key (not unlike iOS's Keychain). While this is not a new concept (system-wide credentials in Android 4.x require access to be granted per-key), the interesting part is how it is implemented in Android M. The system keystore service now holds an authentication token table, and a key operation is only authorized if the table contains a matching token. Tokens include an HMAC and thus can provide a strong guarantee that a user has actually authenticated at a given time, using a particular authentication method. Tokens are generated by a newly introduced system component, called the gatekeeper. The gatekeeper issues a token after it verifies the user-entered password against a previously enrolled one. Unfortunately, the current AOSP master branch does not include the actual code that creates these tokens, but there is a base class which shows how a typical gatekeeper might be implemented: it computes an HMAC over the all fields of the hw_auth_token_t structure up to hmac using a dedicated key, and stores it in the hmac field. The serialized hw_auth_token_t structure then serves as an authentication token, and can be passed to other components that need to verify if the user is authenticated. Management of the token generation key is implementation-dependent, but it is expected that it is securely stored, and inaccessible to other system applications. In the final gatekeeper implementation the HMAC key will likely be backed by hardware, and the gatekeeper module could execute entirely within the TEE, and thus be inaccessible to Android. The low-level gatekeeper interface is part of Android M's HAL and is defined in hardware/gatekeeper.h. 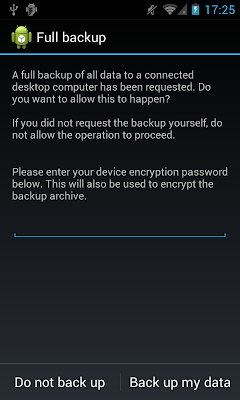 While the framework code that makes use of the gatekeepr daemon is not yet available, it is expected that the Android M keyguard (lockscreen) implementation interacts with the gatekeeper in order to obtain a token upon user authentication, and passes it to the system's keystore service via its addAuthToken() method. The fingerprint authentication module (possibly an alternative keyguard implementation) likely works in the same way, but compares fingerprint scans against a previously enrolled fingerprint template instead of passwords. 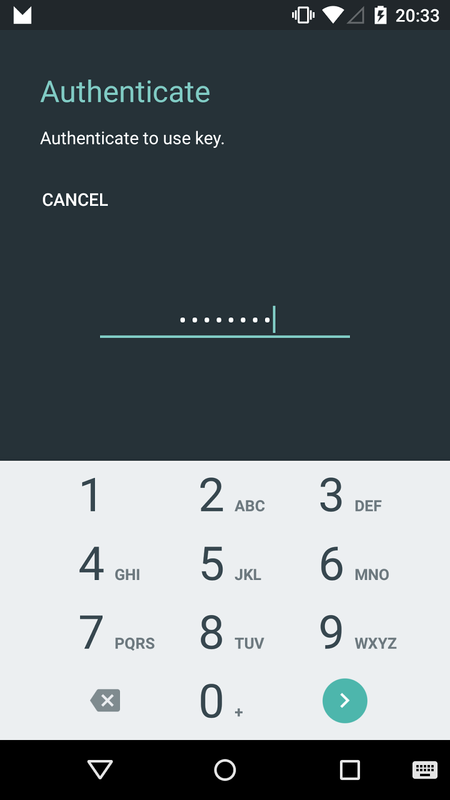 Android M includes a redesigned keystore implementation which allows for fine-grained key usage control, and supports per-key authorization. The new keystore supports both symmetric and asymmetric keys, which are stored on disk as key blobs. Key blobs include encrypted key material, as well as a set of key tags, forming an authorization set. Key material is encrypted with a per-blob KEK, derived from the key's properties and a common master key. The final keystore implementation is expected to use a hardware-backed master key, and run entirely within the confines of the TEE. Android M also includes a new system component, called the gatekeeper, which can issue signed tokens to attest that a particular user has authenticated at a particular time. The gatekeeper has been integrated with the current PIN, pattern or password-based lockscreen, and is expected to integrate with fingerprint-based authentication in the final Android M version on supported devices. First, thanks for the great posts on Android security. They are an invaluable resource for anyone developing security-conscious apps. 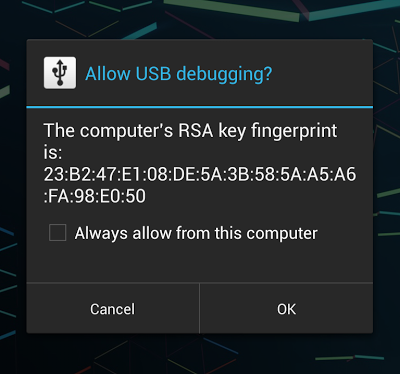 I have a question regarding the security of the Android keystore/keychain on all recent versions of the OS. As your posts have laid out, access to keys in the keystore are defined on a per-app basis such that each app can only access its own keys. This is essentially governed by the app UID (and, as of 4.3, the user id). On your post describing the ICS keychain, you stated, "What this means in practice is that the Android key store is pretty secure for a software solution: even if you had access to a rooted device and managed to extract the key blobs, you would still need the keystore password to derive the master key." 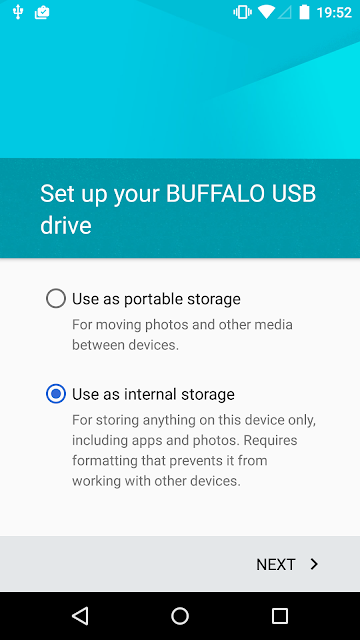 As of Jelly Bean (and now through Android M), support for hardware-backed devices has been provided, such that even on a rooted device, the key material should not be exposed (i.e., the security of the keystore is essentially defined by the security of the TE). These are direct attacks on the keychain, though. Suppose I have a device with app X installed and key K generated by app X. Suppose that the device is rooted. What prevents me from installing malicious app Y, granting it root access, and having app Y impersonate app X (i.e., run under the same UID) such that app Y can now access key K directly? This would seem to preclude any direct attack on the keystore, and instead use the OS permissions system directly to access any key in the keystore. Not much, really. If you can impersonate other apps (including system apps), you've successfully circumvented Android's security model. If SELinux is in enforcing mode (4.4+), simply getting UID 0 would probably not be enough to impersonate apps. That said, if you have physical access and can get root (unlocked bootloader, etc. ), chances are you can also disable SELinux. On a hardware-backed key storage device, can a symmetric key be extracted using the getEncoded() method of the Key - so that another part may use the secret key for encrypting/decrypting information to the device - or is the key not exportable - so that encrypt/decrypt can be preformed on the device only? Hi Nikolay! With a kernel exploit it would still be possible to impersonate apps, or? I think there are number of ways to get the key if you have root access. But the most important is that you can't (or it's hard) to get key from the hardware backed storage. Example of attacks could be to hook Java or C using substrate or xposed framework, also to modify kernel. There always be a moment then the key will be in memory. But it will be always hard to copy this key somewhere into other device. Nikolay, am I right? TrustZone guarantees that you cannot access secure memory from Android. Unless you find a vulnerability in the TEE implementation, you cannot access the key, even though it is in physical memory at some point. Modifying the kernel doesn't help either, because the TEE is a separate OS. My app made for android 4.4.x with the standard KeyStore (with an RSA keypair) had a strange behaviour with Android M.
This is normal? Google changes the KeyStore and Keyguard behaviour? Why? This is very dangerous because if an user removes the keyguard it will also delete all the data in keystores (for example, also VPN credentials?). Can you guide me how to proceed further? Do you know if Gatekeeper is used to protect the full-disk encryption key as well? According to Google's doc, the TEE is used for FDE key derivation, but it is unclear from their description if on-device brute force attempts are possible or not. If I understand it correctly, this means that the TEE is currently only used to prevent off-device parallelized brute-force attacks, but on-device brute forcing is only limited by the speed of the keymaster hardware implementation. It is however rate-limited, and will wipe after 10 or 20 unsuccessful tries. Thanks, very interesting! Where is that retry limit enforced? I couldn't find any reference in the cryptfs.c implementation or the keystore/keymaster docs. Is this something that can be used from Keystore userspace clients as well? The crypto footer only stores the number of tries. 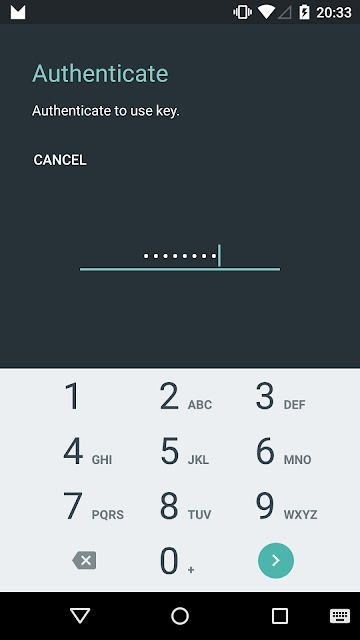 The wipe logic is in the CryptKeeper app, which is what you see when you enter the FED PIN/password on boot.